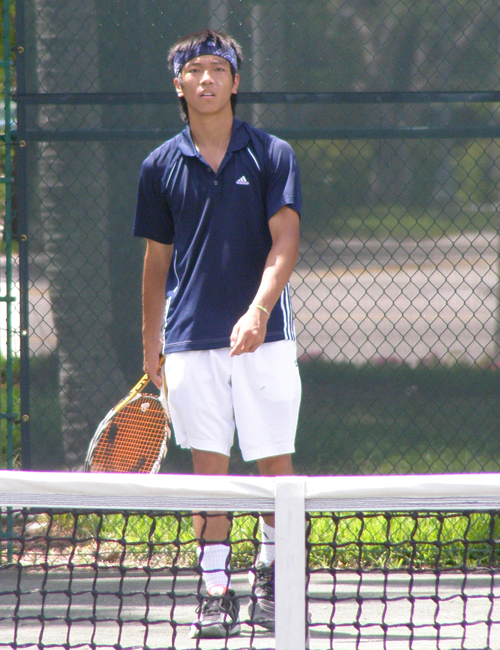 In 2008, I was able to come down to Florida and cover four age groups of the USTA National Claycourts. I didn't get to repeat the feat last year, but when I had the opportunity to do it this year, I couldn't wait. The only hard part (besides dealing with the extreme heat and high humidity) is deciding where to go first. 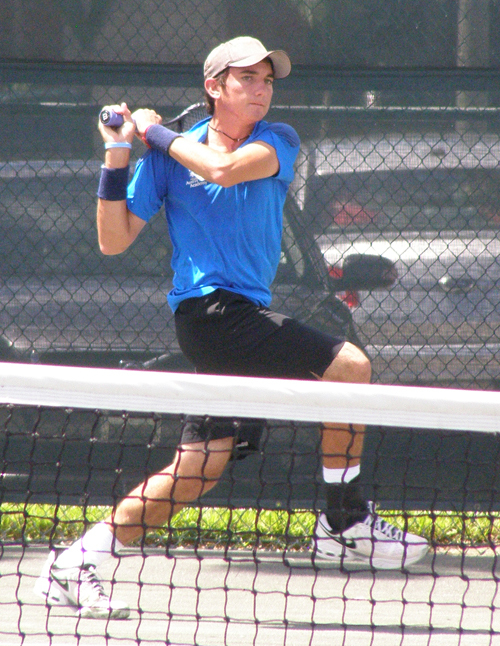 I'm staying in Delray Beach, so it was a natural start and I headed over to the Delray Beach Tennis Center to watch the Boys' 18s. It was a pretty good day for the seeds, with a few exceptions. 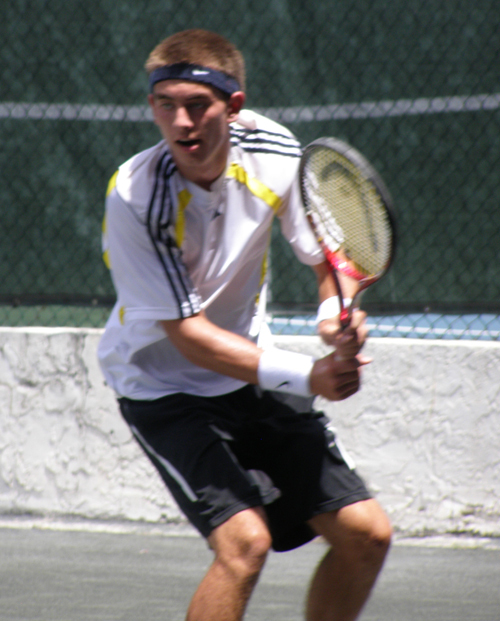 The big upset of the day here was John Richmond's 6-4,6-2 win over second-seeded Emmett Egger, but the big news was local player Zachary Krumholz of Palm Beach taking out No. 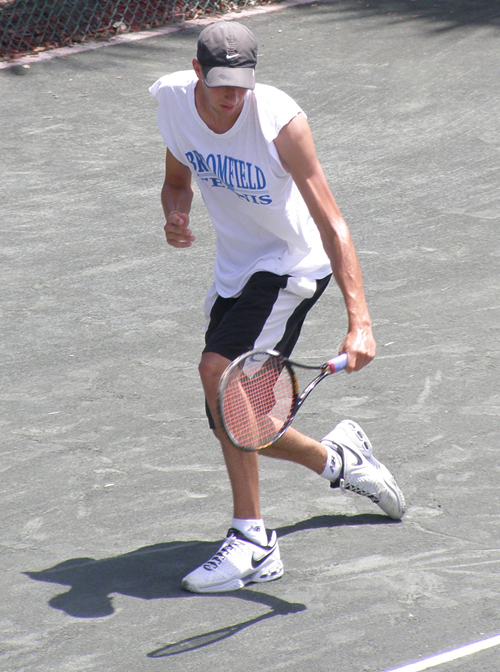 8 Jeffrey Offerdahl, 6-3,6-4. There were also a few lower seeds eliminated in the stiffling heat: Nick Papac, Alex Sidney (right), Denis Nguyen, Winston Lin, Marcos Giron, Robert Verzaal and Chase Curry. My radar for spotting the matches to watch must have been a bit off today because I only saw one of the upsets, but Carl Egue's defeat of Alex Sidney (17-32)which he clearly earned. 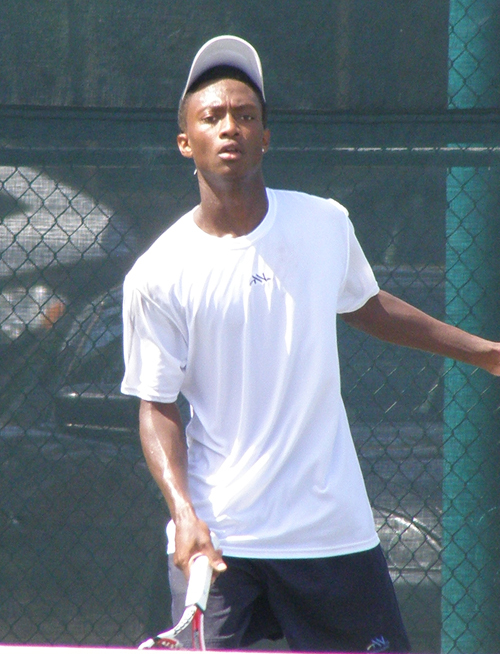 I was impressed with the calculated comback of Justin Crenshaw (17-32), he came back from 2-6 to take the next 12 of 16 games and win the match. 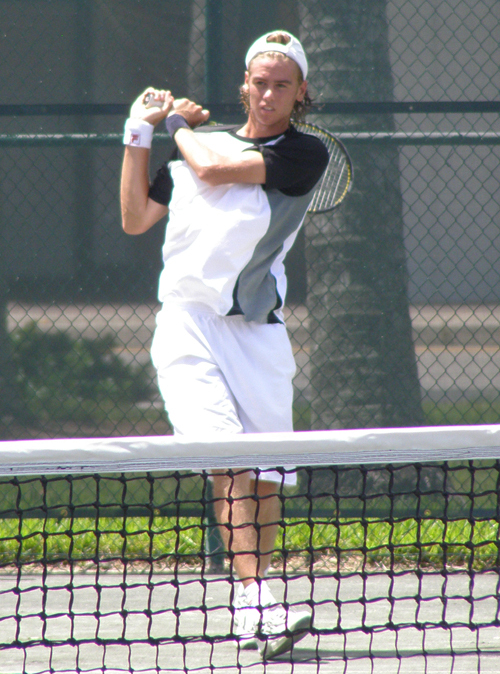 Boris Bogomolov was sporting a bit of the temper I had seen on his professional-playing brother Alex, but it didn't help get him past Rickey Baylon. 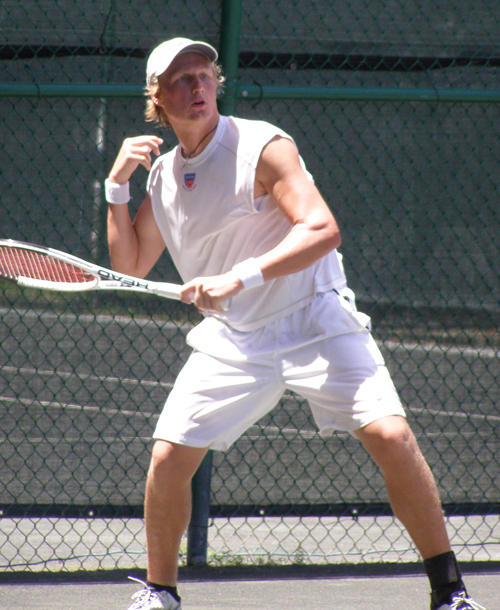 I did a double-take when I saw top-seeded Bjorn Frantangelo on the court as I flashed back to when I first saw him on these courts in the 12s. It's clear both he and has game have grown and he dismissed Taylor Shamshiri, 6-0,6-4. 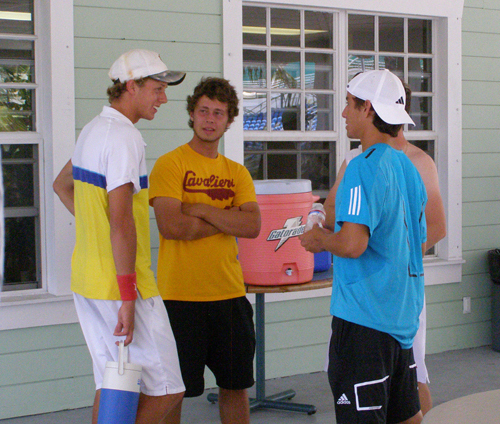 In the afternoon I was over at Broken Sound Country Club for some Boys' 16 doubles. This is usually the age when I walk over to the courts and don't recognize anyone because they've grown a foot since the 14s! That rule held true today as I walked past two players I've watched more times than I can count -- Richard (RJ) DelNunzio and Thomas (TJ) Pura (above). Though it took me a bit to recognize these now young gentlemen, the volleys of RJ & TJ were very familiar and led the No. 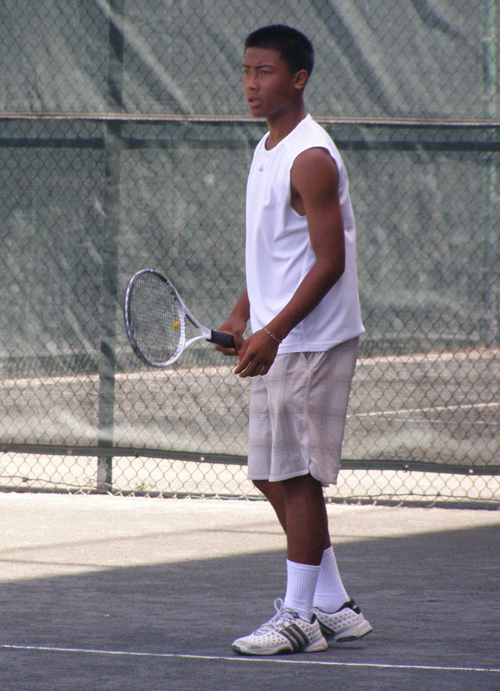 2 seeds to a straight set victory over Deepak Sabada & Brandon Sutter. 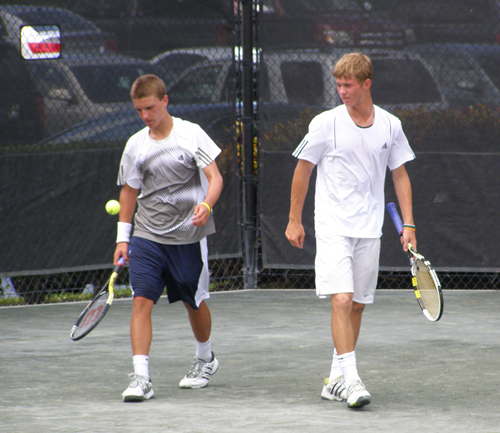 Not all seeds advanced today at the Boys' 16s, though. The biggest surprise was Henry Craig's win over top-seeded Nolan Paige. Also eliminated was Thai Kwiatkowski (14), Matthew Alves (13), Nicholas Hu (16), and alpha seeds Mihir Kumar, James Boyd, Morgan Mays, Howard Weiss, Alex Scheinman, Nicholas Naumann. 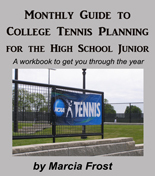 I'm hoping to catch some Boys' 16 singles matches on Thursday. I'm off to the Girls' 12s on Tuesday at The Polo Club in Boca Raton to check out this youngest age group.